When I first looked at the table of contents for recipes inside the BBA before deciding to do the baking challenge, I had warning bells immediately go off inside my head. The catalyst for the bells was the formulas for brioche and cornbread. My dear friend Cristiana who is also a pastry chef instructor at Le Cordon Bleu Ottawa once said,”When you find a good recipe for a dish, that is tried and true, you stop looking elsewhere.” There is absolute truth in that statement because to continue looking after you have found the recipe that works is both a waste of valuable time and costly ingredients. 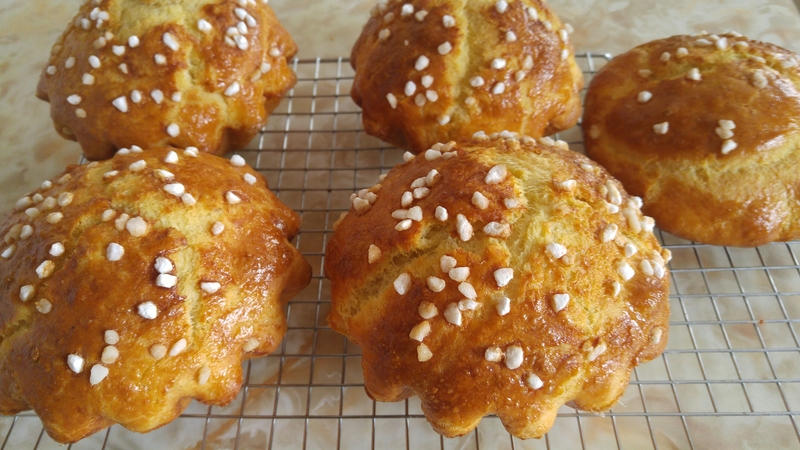 Brioche is a member of the Viennoiserie family of breads and pastries. It falls in the same category as croissants, puff pastry and danish. It can be considered la crème de la crème of breads that are enriched with eggs, butter, whole milk and a small amount of sugar. 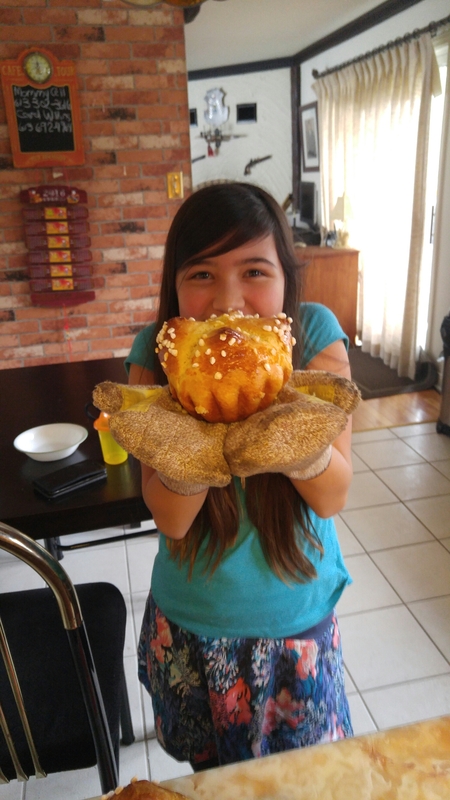 My little Emily making Chef Chabert’s version of brioche. Peter Reinhart lists three formulas in his book Rich Man’s, Middle Class and Poor Man’s brioche. The names correspond directly to the amount of butter in each formula, I thought rather a clever catch phrase as brioche is widely albeit erroneously thought to be the reason Marie Antoinette lost her head during the French Revolution. 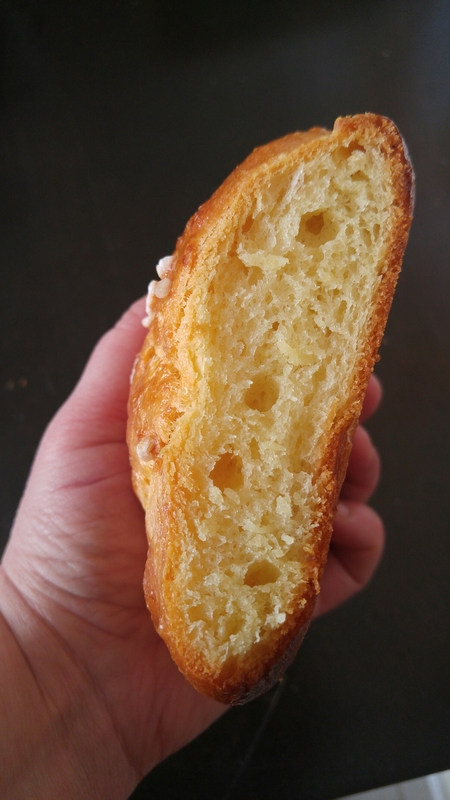 Queen Marie is often quoted as saying Ils n’ont plus de pain, qu’ils mangent de la brioche. Loosely translated They don’t have bread, let them eat brioche (cake). The truth of the matter after having done a little research is that nowhere is there a record that the Austrian princess then French queen ever uttered such a saying. In fact the first record of the quip anywhere was from political philosopher Jean Jacques Rousseau in his autobiography written in 1765 when Princess Marie was the tender age of 9. Why was the political catch phrase inflammatory? What I know to be true from experience, and what I confirmed from sources such as the Smithsonian and History.com is that the French have always taken their bread seriously. Bread is part of their national identity and their heritage. During the 1700’s the bulk of what the poor spent their money on and ate was bread. Poor harvests in the late 1700’s meant that the price of good wheat skyrocketed and the poor suffered and simmered at the inequality between the upper class and their own. Starvation ensued and the rumblings of a revolution began. Brioche is enriched with eggs, butter and sugar, elite ingredients reserved for the rich and aristocracy. To flippantly say, let them eat brioche showed just how out of touch and removed Queen Marie was with the lower classes. Bogus charges were brought before an all male revolutionary tribunal and Queen Marie lost her head. 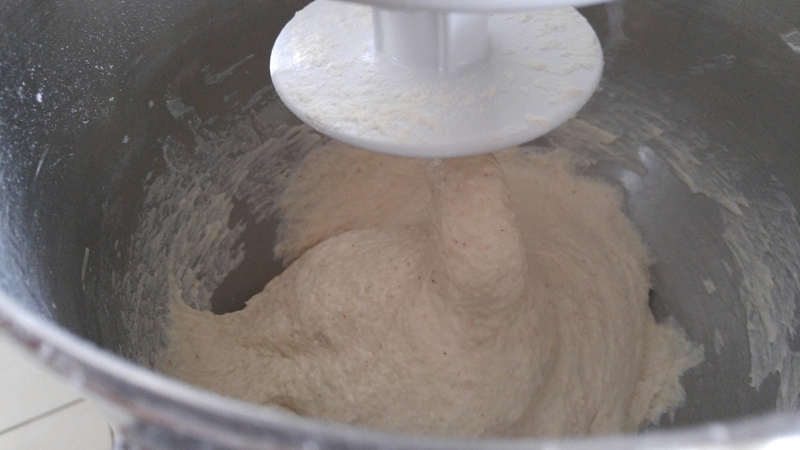 I have a formula for brioche that I love and reminds me of eating brioche in my beloved Paris. I learned the technique and recipe while taking a Viennoiserie class at Le Cordon Bleu Ottawa. The formula is very different from the formula in the BBA. 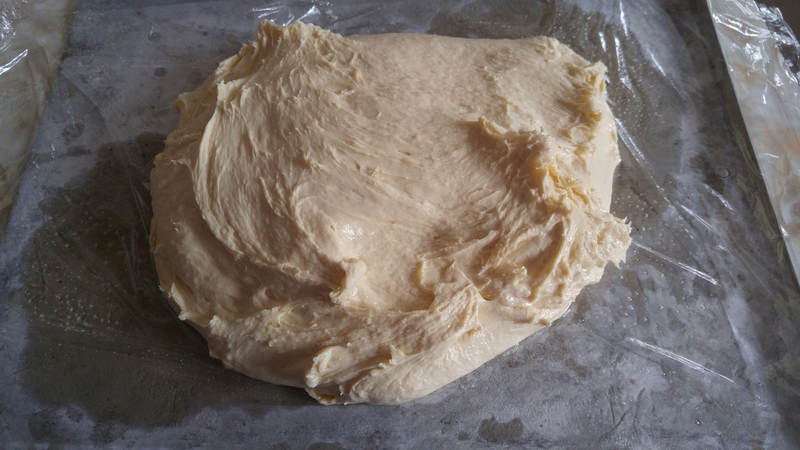 Mis en place for the dough…yes, that is an entire pound of butter and 5 large eggs. 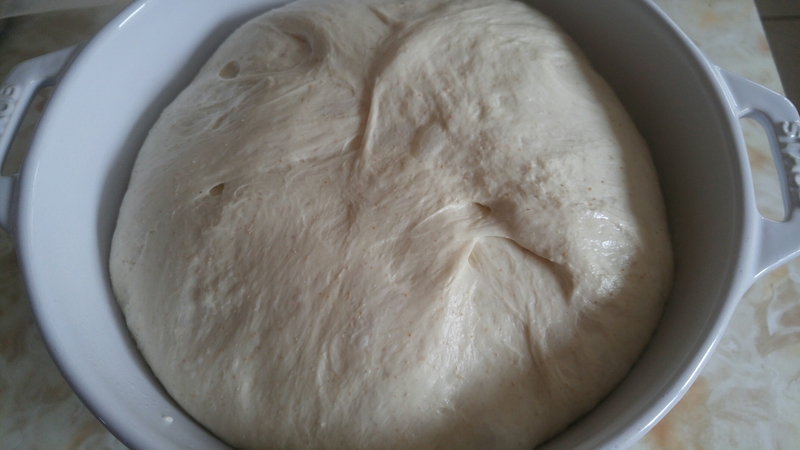 The dough was so hard to work with on account of the volume of butter. 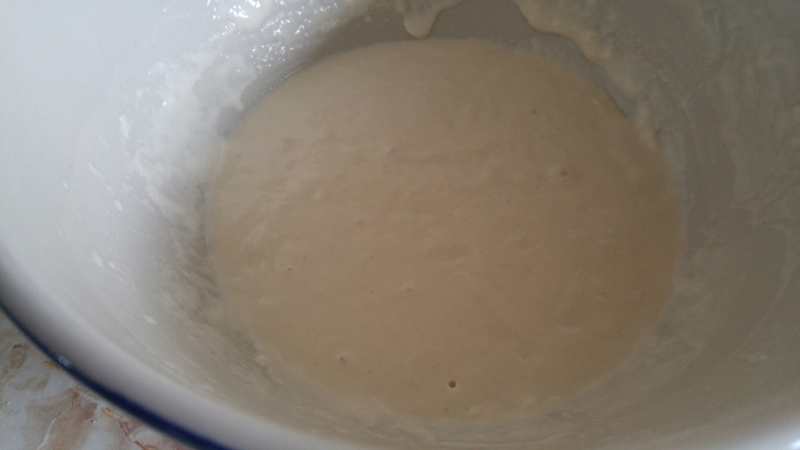 Into the fridge overnight. Portioned and prooved. At this point I instinctively knew the taste would be the bar but the texture would be off. Baked and dotted with the last of my pearl sugar from Paris. The taste of this bread was outstanding as was the colour from the insane amount of butter within the dough. Our family found the texture and the appearance to be off from what we know and love. 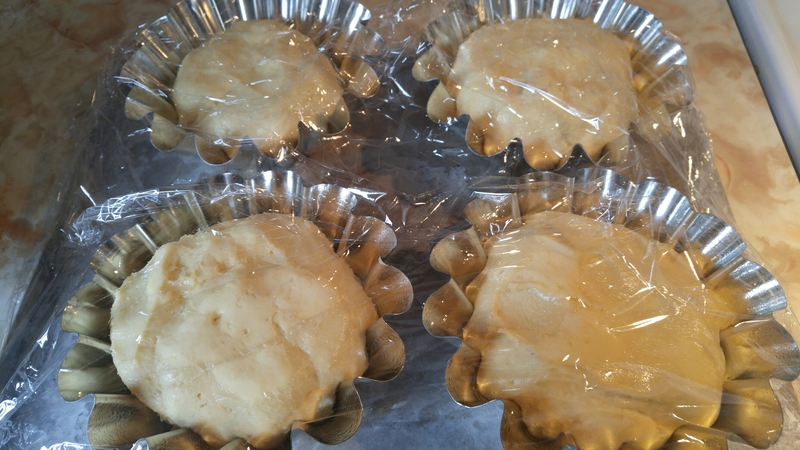 It took forever for the dough to rise to just scant of the top of the fluted baking tins. Once in the oven there was very little oven spring so we found the bread to be shorter from what we know to be true brioche. In addition the texture of the crumb and crust was flaky almost sandy. 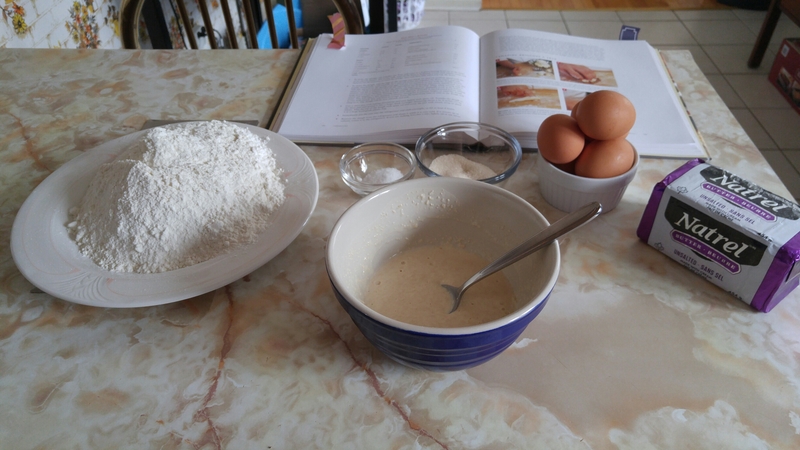 So, I have decided to listen when I hear bells and that means I will not make the remaining formulas for middle class, poor man’s brioche and the cornbread. I have tried and true recipes that my family loves. We scored the brioche at 16 points…10 for taste and 3 each for appearance and texture.